This is how CP Air finally got around the FAA approval process – instead of starting a brand new airline, they’ll take over an existing airline that already has FAA certification. 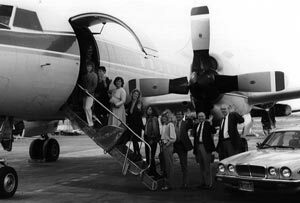 Ninety-six-year-old Rancho Santa Fe millionaire Ted Vallas held a meeting of the stockholders and supporters of his-yet-to fly California Pacific Airlines on November 16. His announcement was the first piece of good news since 2013 for the proposed Carlsbad-based airline. Vallas, along with chief operating officer Paul Hook, announced that CPAir has purchased a 58-year-old airline, currently flying as SkyValue Airways. The small airline flies scheduled flights out of Denver to small Midwestern towns. The company also operates a large charter jet service based in Kennesaw, Georgia, for numerous NCAA college teams, Major League Soccer, and NASCAR’s Joe Gibbs Racing Team. CPAir expects to be “wheels up” out of Carlsbad’s McClellan–Palomar Airport by April 2018, flying to six airports: Sacramento, Oakland, San Jose, Las Vegas, Phoenix, and Cabo San Lucas, with up to 15 flights per day. Vallas, who has funded most of the startup cost himself, said he will be spending $500,000 on promotion for the airline and Carlsbad airport. 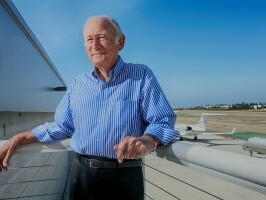 SkyValue Airways’ president and CEO, Darrell Richardson, who will remain in that position under CPAir, said his airline already has a relationship with volume discounters such as Kayak, Priceline, and Travelocity — a shortcoming of other startup airlines that had attempted to establish service out of Carlsbad. Carlsbad Chamber of Commerce president Ted Owen confirmed during the meeting that the city has approved the building of 1.8 million square feet of office industrial space in the past 12 months. The County of San Diego’s Jessica Northrup, communications officer for land use and environmental concerns, confirmed that on November 14, “The county received an application from CPAir and is currently reviewing it to determine if it is complete.” Last year, the straw that seemed to break the airline’s back was after several failed attempts at FAA certifications, having to furlough all employees, and turn the planes back to the leaseholder, the county canceled its previous agreements with CPAir. Previously, county officials have cautioned the airline from making starting-date predictions. “The time it takes from when an application is accepted to when an agreement may be issued depends on the applicant’s scope of the planned services in the application,” e-mailed Northrup. CPAir’s projected operation, if accomplished, will be the largest commercial airline operation the airport has ever had. The company has obtained five Embraer ERJ 145 regional jets, with options to purchase two longer range Embraer ERJ 170s. The 50-seat jets will be reduced to 44 seats to allow for more passenger comfort. “These jets fly faster than a 737, and they’re perfect for getting up and down quickly. Even the restrooms are larger than a 757’s,” said Hook. How does April 2018 sound? California Pacific Airlines looking to start operations out of Palomar Airport! California Pacific Airlines (Carlsbad, CA) has once more announced plans to start commercial passenger operations this time using an existing Part 121-certificated carrier. In an interview with Oside News, the Carlsbad, CA-based start-up’s Chief Commercial Officer Paul W. J. Hook said an unspecified “58-year-old airline” had been acquired with an official announcement due on November 16. According to Hook, California Pacific Airlines aims to launch in April next year using an all-Embraer fleet of four ERJ-145s and two EMB-170s. Cities to be served include Phoenix Sky Harbor, Las Vegas McCarran, Sacramento Int’l, Oakland, San José, CA, and the Mexican resort town of San José Cabo. The brainchild of nonagenarian entrepreneur Ted Vallas, California Pacific Airlines has undergone at least three unsuccessful attempts at acquiring an Air Carrier Certificate (ACC) from the US Federal Aviation Administration (FAA). The last attempt, in 2013, was suspended following an FAA manpower shortage brought on by budget cuts. As such, the purchase of an existing airline replete with all the necessary permits and certificates is proving an increasingly popular shortcut to market among US-based start-ups. As recently reported, USGlobal Airways (formerly Baltia Air Lines) is in the process of acquiring Songbird Airways (SGB, Lakeland) as part of its own, separate bid to start commercial services. 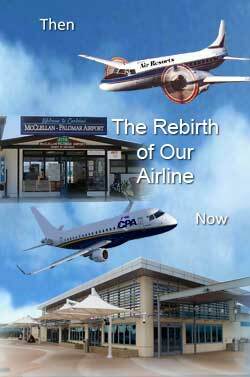 California Pacific Airlines – the dream is still alive! In the late morning on a weekday, the terminal at McClellan-Palomar Airport calls to mind a ghost town. The building is vacant, the flight board blank. Six rocking chairs in the waiting area sit motionless. The only sign of life is the whirring of a small plug-in fan operating in the men’s restroom. But if Ted Vallas gets his way, the cozy airfield that now serves only private flights will soon be bustling with passengers on commercial jets traveling up and down the West Coast. 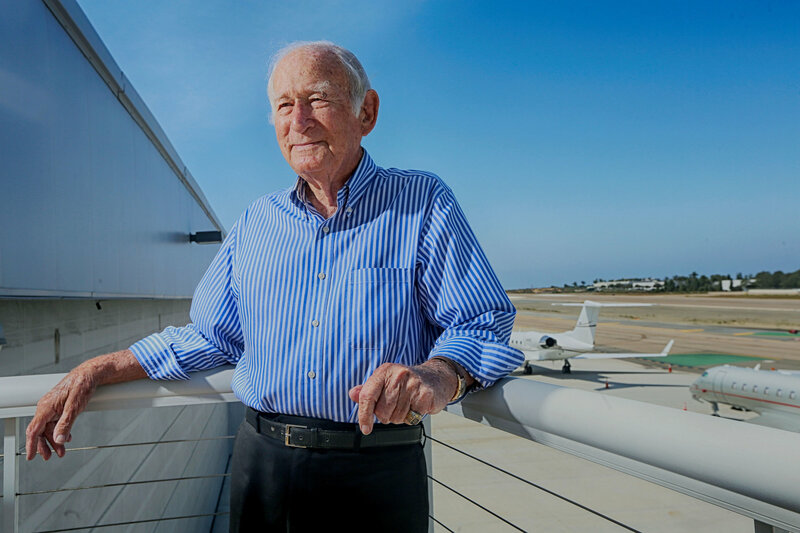 Mr. Vallas owns California Pacific Airlines, known as CP Air, his latest venture in a peripatetic business career that has included stints in areas as varied as land development and other aviation-related ventures. CP Air has sat on a metaphorical runway for years — engines idling, ready for takeoff — while awaiting certification by the Federal Aviation Administration. Mr. Vallas’s patience is wearing thin. After all, he is 95, and he regards the airline as a legacy, an exclamation point to a colorful life. In a second-floor office on airport grounds bedecked with models of planes and a black-and-white framed photo of his wife of 67 years, Mr. Vallas addresses why he does not abandon the quest. If anything, his quest shows how difficult starting an airline can be in an era of consolidation. Conceived decades ago, the airline was set to begin operating as early as 2010. His plan seemed straightforward enough: Serve the booming population north of San Diego with routes to cities including Oakland, Sacramento, San Jose, Las Vegas and Phoenix. By 2012, Mr. Vallas was confident enough in his venture to hold a gala at the airport where he showed off his first purchased plane. Complicating matters has been disagreement between Mr. Vallas and the county, which owns McClellan-Palomar, over whether the airport meets environmental standards. A news conference this month took a strange twist when an airport spokeswoman, Alex Bell, advised Mr. Vallas that he needed another environmental assessment, which could push back approval by two years. Having distributed copies of the in-flight magazine at the gathering, Mr. Vallas disagreed and insisted that the environmental hurdle had already been cleared. Still, Mr. Vallas remains optimistic. He points to the economic impact CP Air could provide, and says there is a need in the growing region known as North County that would be well-served by his airline. John Selvaggio, the airline’s former chief executive and a big proponent of the venture, is less complimentary than his former boss about the support he received from local businesses and county officials. “What has to change is the political climate in terms of support from the community, the county and maybe the state,” he says. The government shutdown in 2013 and the F.A.A.’s staff reduction did not help matters, the agency acknowledges. Mr. Vallas “was a victim of the circumstances,” said Mr. Selvaggio, who remains a proponent of the airline, citing growth limitations at San Diego International Airport. “He had the right game plan,” he said. The process of greenlighting a new airline has become more complicated since Mr. Vallas sold a previous venture, a charter service called Air Resorts, in 1997. He acknowledges the vast increase in paperwork since that era but contends that the conditions for acceptance have been met. Mr. Vallas’s airline is not the only one that has encountered bureaucratic headwinds. 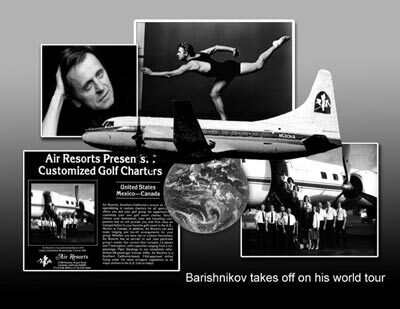 Other proposed airlines are in limbo for various reasons, including Baltia Airlines, created in 1989 to fly between New York City and Russia, which still lacks the authorities’ blessing. Most of the funding for CP Air has come from Mr. Vallas’s pocket, with an additional $2 million from “family and friends” and $3 million from a loan, he says. Some two decades after declaring personal bankruptcy following a breach of contract related to the purchase of planes from Northwest Airlines, Mr. Vallas places his net worth at $20 million. Jumping into markets already serviced by established airlines can be difficult. John Heimlich, vice president and chief economist of the trade organization Airlines for America, suggested that upstarts might be better off targeting small and midsize locales. “There are definitely some untapped markets out there,” he said. Despite the series of road bumps, Mr. Selvaggio said he would be surprised if his onetime colleague backed down. His wife, June, has tried to nudge Mr. Vallas into retirement after a congestive heart issue, combined with a stroke while in the hospital, sidelined him for a month. Mr. Vallas, whose interest in aviation dates to his years in the Navy, may have downshifted, but not much. There is golf twice a week on two replaced knees, plus other forms of exercise. And an airline to get off the ground. As he approaches centenarian status, Mr. Vallas hears a clock ticking. Thanks to the New York Times for the article. Canada’s business aviation sector directly contributes total of $3.1bn in economic outputs, $1.3 in GDP, $650m in taxes, 11,500 person-years and $800m in wages, according to a new study commissioned by the Canadian Business Aviation Association (CBAA). The report, 2014 Economic Impact of Business Aviation in Canada, is the first detailed examination of the size and economic impact of business aviation, and reveals an industry that is integral to wealth generation and connectivity for communities and businesses across the country. As well as economic impacts, the report includes case studies, and examines business aviation operations by purpose and by aircraft. Higher wages: Business aviation annual wages average $69,000, well above the national aggregate average of $47,000 and higher than average wages in construction, information/cultural industries, and transportation and warehousing. From sea to sea to sea: Canada is home to approximately 1900 business aviation aircraft, including both fixed wing (76%) and rotor (24%), spread across Canada with the majority based in Quebec, Ontario, Alberta, and British Columbia. Close to one out of five flights: business aviation is responsible for 18% of all domestic air movements in Canada. When all impacts are included (indirect and induced, as well as direct), business aviation’s total contribution is even greater: $5.4bn in economic impacts, $2.6bn in GDP, and 23,500 jobs, and $1.5bn in wages. These days, flying can literally be painful. Airline seats are smaller and closer together than ever before, and more passengers are crammed onto every plane. For extra money, customers can get more legroom, board early or get access to Wi-Fi. But a lot of us aren’t willing to fork over the extra cash, so our experience is just getting worse. Starting in 2015, Delta Air Lines will offer more class options, including “Basic Economy,” where customers can pay less money for fewer benefits. Basic Economy passengers can’t change flights, upgrade their seats, or receive a refund for unused tickets. The low sticker price will attract a lot of bargain shoppers, but the financial relief might not be worth the lack of benefits. McGee says despite removing complimentary services, airline fares haven’t budged, even in the face of falling fuel prices. And airlines aren’t just sacrificing things like a free drink or extra leg room, either. For the last several years, McGee says airlines have started to tap the cheap labor of Third World nations — and they often do so at the expense of safety. Overseas, unlicensed technicians frequently repair aircraft owned by American airlines, with one licensed mechanic signing off on all of the work being performed. This story is based on an interview from PRI’s The Takeaway, a public radio program that invites you to be part of the American conversation. United Airlines announced this week that it will be closing its operation at Palomar-McClellan Airport. Operated as United Express through their partner, SkyWest Airlines, the up-to-seven flights daily to LAX will cease sometime before April 2015. United was the only regularly scheduled airline to fly out of the Carlsbad airport. This may be good news for area homeowners, who often oppose airport expansion — the same homeowners who purchased homes in the runway’s flight path. But for many holding tickets on United’s December 19 Flight 5346, they were surprised to learn of the change. Christy from Cardiff says she travels through LAX on her way to Saskatchewan about two of three times a year. She chooses Palomar, even though a little more expensive than Lindbergh, so she doesn’t have to deal with the traffic and parking. “My travel is easier,” said Christy. She said most impacted will be her employers at her office across the street from the field. “They often fly to Europe and always fly out of here for their flights out of LAX. They’ll pay up to $350 more just to not have to drive to L.A,” added Christy. Fred says he flies through LAX about 20 times a year on business. This time he had his wife and two kids with him. They live in Carmel Valley, and though halfway between Lindbergh and Palomar, he thinks it is much more convenient to fly out of Palomar. Blair was returning to his home in Houston. He regularly visits his mom in North County. “Now I’ll have to fly into San Diego and rent a car. I’ll miss this little airport,” he said. Soon, the small ticketing terminal will be empty. United Airlines graphics and those of a planned California Pacific Airlines, which never got off the ground, will be all that remain. The airport, with its 4,897-foot runway, will remain open, in other parts of the field, to private aircraft operations, maintenance facilities, flight schools, and jet charters. When Palomar first accepted commercial aircraft, America West Airlines serviced North County flyers with several daily flights to their hub in Phoenix. The cost of flights from Palomar to an America West destination was the same as out of Lindbergh, a marketing plus for the popular airline. America West service was shuttered when US Air bought it out in 2005. Palomar’s convenience, ease of parking, lack of traffic, can be expensive. United charges more for their flights out of Carlsbad vs. San Diego. And sometimes offers long layovers, up to six hours, to connecting flights at LAX. As an example, booking a round trip flight from Carlsbad to Chicago, from a Sunday to a Saturday, with a 21-day advance purchase, would cost $586 (Lowest non-red eye quoted by the airline’s website on December 19). However, of the seven flights out of Carlsbad, only one had a less-than-two-hour layover in LAX. It was $645 round trip. The other flights, as low as $547, had an up to five hour, 35 minute layover, or added additional stops in Austin, Las Vegas, Oklahoma City, or Wichita. United offers two nonstop flights from San Diego to Chicago for $476 roundtrip. Flights as low as $378 could be found with one stop in either Denver, Houston, LAX, or San Francisco. The reason given for the pulling out of Carlsbad: SkyWest is transitioning out of its fleet of Brazilian-made, 30 passenger, turboprop Embraer 120 aircraft. New FAA regulations starting January 2015 will make slower planes like the Embraer less effective to operate, with the new regulations regarding pilot on-duty times. Unfortunately for local homeowners, corporate planes and chartered jets, soon to be the airport’s mainstay business, have been increasing over the years. SurfAir, an all-you-can-fly membership airline began serving Carlsbad to seven California destinations on November 17, out of the Premier Executive Jet terminal.